The city of Milwaukee briefly was part of the national pastime in the beginning. Milwaukee was a part of the 1891 American Association and also a charter member of the American League in 1901. Outside of those brief periods though, Milwaukee was minor league. For over fifty years, residents of Milwaukee and the state of Wisconsin were destined only to watch minor league baseball. Beginning in 1931 Milwaukee flirted with the idea of building a first-class ballpark in hopes of luring a Major League team. After two decades of off and on discussions, ground was finally broken. 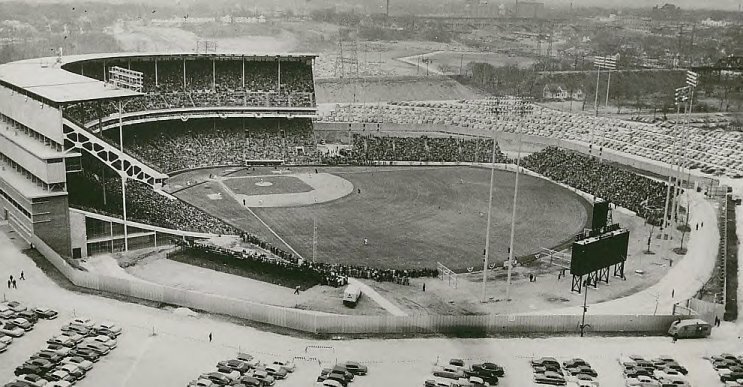 On October 19, 1950 construction began on what was to become Milwaukee County Stadium. Construction continued into the early part of 1953. The stadium was to be completed by the home opener of the minor league Milwaukee Brewers, an affiliate of the National League Boston Braves. The Braves had been floundering in Boston with declining attendance in recent years and owner Lou Perini hoped to move the team to a more financially sound location. On March 13th, 1953 Perini announced his intention to petition the National League for permission to move the Braves to Milwaukee. On March 15th, County Stadium opened its doors to public for an open house. Over ten thousand visitors toured the stadium and hoped that the Braves might soon inhabit the facility. 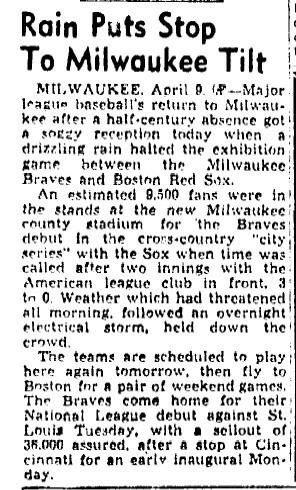 Then in happened, at 1:33 PM Central Time on March 18th, 1953, the National League owners voted 8-0 to allow the Boston Braves to move to Milwaukee. Chaos ensued. Was Milwaukee ready? A quick change with the Pittsburgh Pirates solidified a schedule. The team that drew only 281,000 fans the previous year in Boston was now the talk of the town. On April 8th, 1953 the Braves pulled into Milwaukee from their Bradenton, Florida Spring Training home and saw over 12,000 fans waiting at the train depot for their arrival. A parade for them drew 60,000 wild fans. Milwaukee was crazy for its Braves and they hadn’t even played a game. On May 20th, 1953 the Braves had their 13th home game of the season. With the attendance at this game, they surpassed the entire 1952 Boston season total! 1953 would continue to be magical for Milwaukee. The Braves were playing winning ball and flirted with first place all season. At the all-star break, they were 1.5 games behind the Brooklyn Dodgers. Eddie Mathews and Warren Spahn represented Milwaukee in the all-star game. Mathews spent a good part of the season chasing Babe Ruth's home run record. This chase was heavily chronicled daily in the two Milwaukee papers. He ended up short, but still led the Major Leagues with 47. The Braves set an all-time National League attendance mark with 1,826,397. In the standings they finished the season 92-62-3, in 2nd place, 13 games behind the Brooklyn Dodgers. It was truly a great start in Milwaukee.